My husband went out crabbing with his brother last weekend. It was a time to reconnect with his brother who is 22 years older than him. They have gone once before and only brought home a couple crabs. But this time they had a good haul. 15 crabs! TJ brought back 8, we shared them with others as I am the only one in the house who enjoys crab. Zarek was so interested in the crabs that TJ pulled up videos on his phone to show him the whole process of crabbing. Zarek really wanted to eat crab he came downstairs begging to try it. But I guess he decided it wasn’t as exciting to eat crab as it was to see them and learn about them. 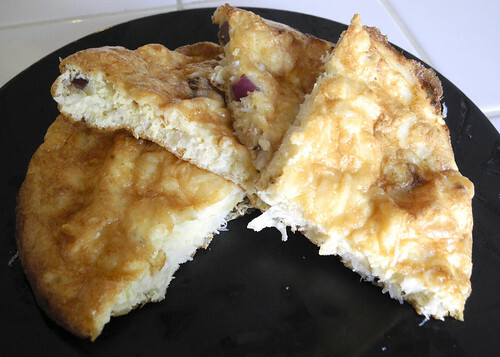 Of course I had to try out making a crab frittata for Frittata Friday. This recipe is so easy to make and I can imagine you could make it with canned crab if that is all you have. Mix crab, eggs, onion, lemon juice, and seasoning.